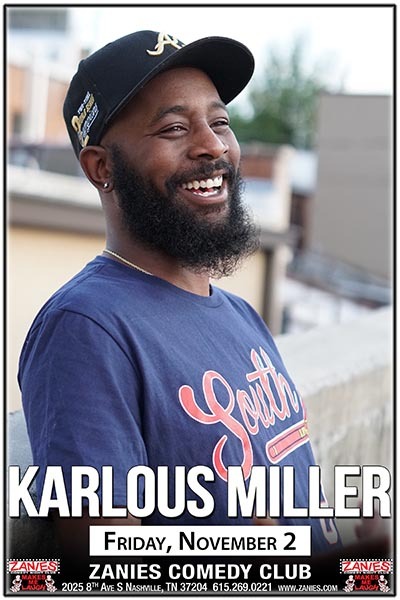 Mississippi native Karlous Miller grew up in a large blended family, including eight siblings, who all became a major influence on his edgy and boisterous comedy style. After working briefly as a firefighter in Oxford, he moved to Atlanta in 2005 to pursue a career as a stand-up comedian. He's been making audiences laugh ever since. Miller's first television appearance was on "Robert Townsend's Partners in Crime - The New Generation." Since then, he has appeared on "The Mo'Nique Show," Season 2 of BET's prank dating show "Hell Date" and MTV's "Yo Momma," and he was also a semifinalist on Bill Bellamy's "Who's Got Jokes." Recent credits include HBO’s All Def Comedy, 6 Seasons of MTV's "Wild 'N Out" as well as Season 12, which is currently in production and has a 30 minute special on Kevin Hart’s Laugh Out Laugh Network. In addition, he is the Creator and one of the leading featured comics (alongside DC Young Fly & Chico Bean) of the popular podcast, The 85 South Show, where they not only make you laugh through your audio device, but also exert that same hysterical energy and entertainment in live shows across the country. He has traveled extensively around the world, performing in St. Thomas, Germany, London, and Kuwait. His biggest comedy influences are Redd Foxx, Bernie Mac, Mo'Nique, Richard Pryor, Eddie Murphy, Cedric the Entertainer and Steve Harvey. Miller also has a passion for music and has worked with musicians like Jermaine Dupri, Case, Gucci Mane, Dem Franchize Boyz, Grandaddy Souf, Big Oomp and T.I. 's Grand Hustle Comedy.